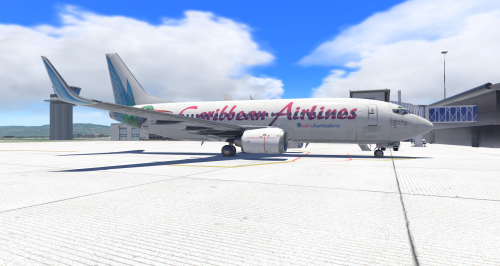 2 Caribbean Airlines liveries for the IXEG 737. 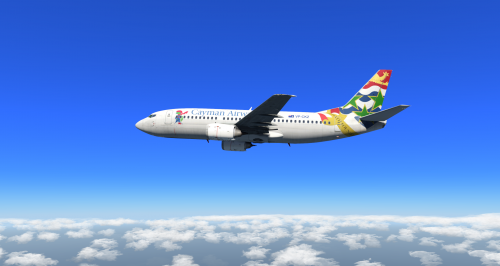 Cayman Airways VP-CKZ for the IXEG 737. SkyMaxx Pro v3.2 Has Been Released! For me, I have black clouds at dawn. Between 4-6AM. Anyone else experiencing this? Noted. Could the mechanism connecting it to fuselage be modeled so that it doesn't look like it's just floating? Same issue, but on the inside of the right nose gear door. I don't have screenshot right now to upload unfortunately. There seems to be a small space between where the elevators and fuselage meet. It's also evident in the shadows that there's a small space there too. Pretty small, but this has been there since the 1.0 release. The blue bg colour for the textures is being shown instead of the wing texture. See attached.